These Turkey Quinoa Meatballs are a healthier take on your traditional meatball recipe! 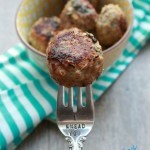 With quinoa, spinach, ground turkey and garlic, these are healthy meatballs you can feel good about serving! Today I am excited to have Robin from Knead to Cook here with us to share one of her favorite quinoa recipes. Quinoa is considered a super food and for good reason! It is low in fat, no cholesterol, believed to have anti-inflamatory properties, is packed with minerals like calcium, iron and magnesium. I love quinoa, any color, first for its versatility. You can add it to pancake batter, mix it up with fresh fruit and drizzle with a bit of honey or maple syrup. From there you can replace your boring greens and add your veggies for a tasty salad for lunch that is packed with valuable nutrients. Then for dinner, instead of adding breadcrumbs to your meatballs, add some quinoa. 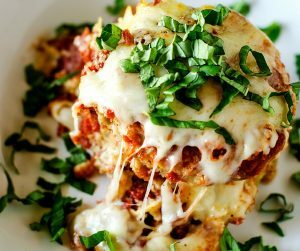 It bulks up the recipe so you use less meat and it adds a wonderful moist texture. For this recipe I decided to add it to my turkey to make meatballs. It added a moist texture and helps bulk up the meatballs so I’m not using as much meat yet adding valuable nutrients to my family’s dinner without them even noticing. Quinoa adds a nutty flavor to your dishes. 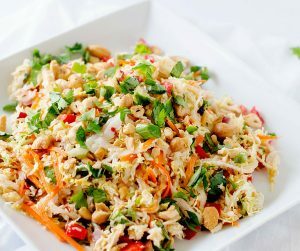 It can also replace rice in traditional dishes. My best suggestion is soaking the quinoa in a large bowl of water for 30-45 minutes prior to cooking. Rinse well. This will help remove the bitter-taste to the finished product. Cook according to package directions. These Quinoa Turkey Meatballs are a healthier take on your traditional meatball recipe! 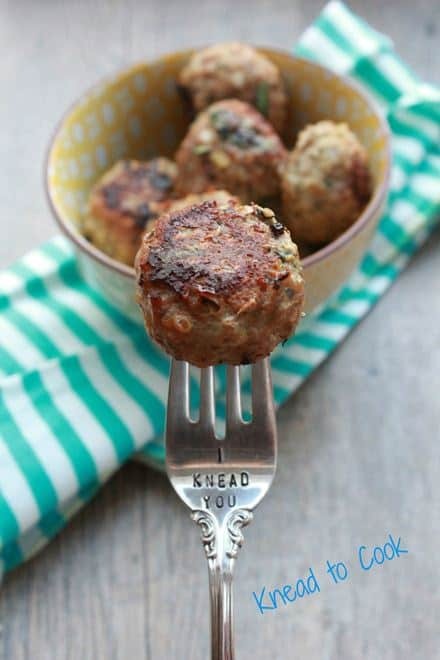 With quinoa, spinach, ground turkey and garlic, these are healthy meatballs you can feel good about serving! Preheat your oven to 350 and spray your baking pan with sides with baking spray. Set aside. In your stand mixer with the paddle attached, add all of the ingredients and mix until incorporated. Knead to Cook is a blog that was created as a way to share healthy recipes with my friends. It has exploded and reached new friends worldwide. I believe that food is the common bond that we all share. Easy, simply prepared dishes that are healthy are my focus. Farm-to-table, minimally processed foods help fuel your body and mind. I’m a mom, avid runner and admitted gym rat. I love creating new recipes and re-creating old family recipes with my own spin. Empowering others is my main mission. I’m obsessed with meatballs. Always looking for new ways to make them.